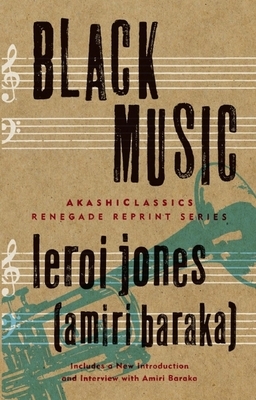 Black Music is a book about the brilliant young jazz musicians of the early 1960s: John Coltrane, Thelonious Monk, Miles Davis, Ornette Coleman, Cecil Taylor, Archie Shepp, Sun Ra, and others. It is composed of essays, reviews, interviews, liner notes, musical analyses, and personal impressions from 1959-1967. Also includes Amiri Baraka's reflections in a 2009 interview with Calvin Reid of Publishers Weekly. LeRoi Jones (now known as Amiri Baraka) is the author of numerous books of poetry, fiction, and nonfiction. He was named Poet Laureate of New Jersey from 2002 to 2004 by the New Jersey Commission on Humanities. His most recent book, Tales of the Out & the Gone (Akashic Books, 2007), was a New York Times Editors' Choice and winner of a PEN/Beyond Margins Award. He lives in Newark, New Jersey. LeRoi Jones (now known as Amiri Baraka) is the author of numerous books of poetry, fiction, and nonfiction. He was named Poet Laureate of New Jersey by the N.J. Commission on Humanities, from 2002-2004. His last two books of poetry, Somebody Blew Up America & Other Poems and Un Poco Low Coup received tremendous critical acclaim.